Andrew Jones then reveals a pattern of distinctive ways (known as Design Thinking) in which they differentiate themselves from traditional firms: from managing the business and running the workplace to talking to customers and recruiting, motivating and rewarding staff. From this pattern, Andrew constructs a ‘Design Thinking’ model built on the principles of architecture, design and anthropology. He sets out the rules for implementing that model and creating organisations equipped to ‘manage the known’ and to ‘build the unknown’. Today, Generation Y employees and ever-more-demanding customers are setting the agenda for business. 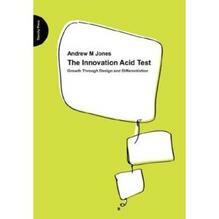 The Innovation Acid Test offers a clear guide for any company seeking to transform itself into the kind of human-centred enterprise that is equipped to meet these challenges. Anyone interested in finding out more about Design Thinking. Business leaders can also measure themselves against the best and most innovative firms in the world while researchers and academics will find a statement of what defines current management and organisational best practice.